A wild breeze is blowing. The fool walks through the door. The winds pick up this time of year, late October, in the upper Mississippi River valley. Oak trees become bare of leaves, twisting into gray sky. The veil between the worlds thins. The New Moon of October 28 comes right before the seasonal holy day of Samhain. This is the end of summer, growing, harvesting. During the season of Scorpio, we can feel the other side—where those who have gone before have gone. This particular Samhain is a time to be aware that not only are wild breezes blowing but it also feels like the sky is falling. When the veil thins, we open to a place between the worlds where the Fool enters and chooses. The planets are conspiring to show us important choices at this time. We are choosing the stories we want to animate all the time. But now, at this time, it feels like the choices are more important than ever. One expression of this is the upcoming election. But this is not the only world-creating choice that we are currently making. Each personal choice right now is also creating the world. At this New Moon, we can step back to see the major planetary influences to gain perspective—to know what our choices are about. Saturn opposite Uranus. These planets are now in an opposing relationship. This current phase of their relationship began in 1988 when the two planets were conjunct. Conjunctions and oppositions, like the new Moon and full Moon phases, represent the primary pulse of life, coming together, pulling apart, coming back together, on and on. At a conjunction of planets, we get ready for their opposition; we need that perspective. At the opposition, we try to reintegrate and find the balance point between extremes—already needing to find conjunction again. The pulse pulls us along. This is where we grow. What perspective did we need in 1988? What integration do we need now? The opposition of these two planets goes on until 2010. We have some time to figure it out. There are interesting parallels between the conjunction of 1988 and the current opposition. A major concern right now is the economy. In 1987 Oliver Stone’s movie, Wall Street, addressed corruption in the financial world. Black Monday, a world-wide stock market crash also occurred in that year. Today we are seeing a mirror of that time, making this a good time to reevaluate our money myths. With Jupiter in Capricorn for a few more months, and Pluto set to re-enter Capricorn this lunar cycle, it is a perfect time to compost old systems. The idea of lay-away is coming back. In some ways, it hasn’t been too hard to pull back from living outside our means. Collectively we are spending less. As the Fool walks through the door, how do we want to choose our new relationship to money? Revolutions happening in the 80s are mirrored by the revolutions we see around us now. If we look at the headlines for 1988 and 1989, we see the same people and issues coming up. In 1988, Jesse Jackson ran for the nomination for president. He gained ground but did not win. The country was not ready for a black candidate. In 2008, Barrack Obama is poised to win the presidency. In ’88 Dukakis did win the nomination but lost against the first President Bush. Some say that Dukakis lost due to negative advertising. Obama is being hit hard with the same tactics and they aren’t working as well. In 1989, millions of people gathered in Tiananmen Square to protest the Chinese government. Recently, protest was stridently squelched by the Chinese during the Olympics. These are just some of the events that show the pulsation between these planets. Some show progress, others perhaps not. The archetypes. Saturn is order. Uranus is chaos. If you are feeling strong imbalance in your life right now, it is because these two forces are at their extremes. However, within the opposition, within this season, integration is possible. The Fool has a lot in common with Uranus. This energy can be reckless; it certainly invites change. Saturn’s job is to impose limits and expectations. How are these two working in your life? Samhain is a good time to evaluate what will bring more balance and awareness into your life. 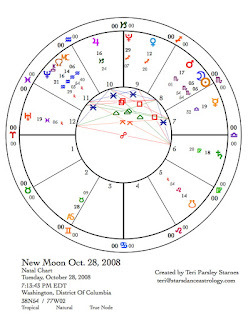 New Moon on October 28 is at 5° Scorpio. This Sun and Moon do not have any other aspects in the chart. They are in seclusion together. Perhaps this is an invitation for us to turn within, rest, and think. The Scorpio themes of death, composting, and seeking depth are appropriate for this month’s seclusion. The chart shows the opposition between Uranus and Saturn in square to Venus. The date of the exact square to Venus is the day before the election. Perhaps the Venus archetype will provoke a readjustment along this opposition. Venus represents the economy, women, beauty, and harmony. In addition there is a strong Neptune in this chart. (Neptune is about to station direct; that always make a planet stronger.) Right before the election there will be a strong desire to believe in a common dream. Neptune represents the communal mindset, which involves our hopes as well as our illusions. We may be setting ourselves up for extreme disappointment. However, the desire to believe will be strong. Added to this theme is that on Election Day, Mars will be exactly square to the stationary Neptune. Mars in Scorpio wants to reveal what is taboo and hidden. This Mars has a direct line to power. Will deception be exposed? Will mass consciousness be manipulated? Perhaps the healing energy of Scorpio will at last compost a long-held illusion. This election will be fascinating. After the election, a series of favorable aspects occur to the Saturn/Uranus opposition. This points to a feeling of euphoria about the possibility of integrating chaos and order. First the Sun will trine* Uranus and sextile** Saturn. Then, Jupiter sextiles Uranus. A few days later, Mercury trines Uranus and sextiles Saturn, and then Jupiter completes the series by forming a trine to Saturn. [See dates below.] In the middle of it all there is a Full Moon. 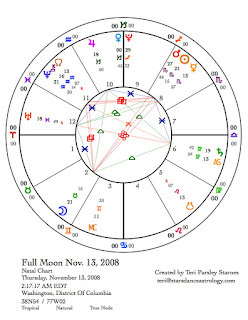 In the Full Moon chart for November 13, 2008, the opposition between the Sun and Moon is exactly square to Neptune. Since Full Moons illuminate and release energy. This one might reveal more about our collective dreams and illusions. The chart shows lots of sextiles and trines. In fact, there is almost a Grand Sextile formation. The missing area that would complete the pattern is between 18 to 21 degrees of Cancer. Anyone with a planet there has the opportunity to click into this pattern, which invites special talents and opportunities to arise. Pluto re-enters Capricorn towards the end of the lunar month. It retrograded back into Sagittarius for the summer. I’ve written before about the significance of Pluto’s ingress into Capricorn. For years, astrologers have been predicting we would have crisis in our financial markets and a change in our expectations of authority and government. This transformation has only begun and we don’t have to fear it. In fact, as the wild breezes blow and the sky and stars seem to be falling, we have the ability to revitalize our relationships to these very things. Sometimes the Fool’s choice is to welcome the opportunities that arise from the experience of crisis. As the veil thins, what will you choose? Thanks for the excellent and informative blog! I'm not an astrologer but you explained everything so I have a deeper understanding. I'm recommending your blog to all my subscribers! Thanks, Ronna. I appreciate the feedback.